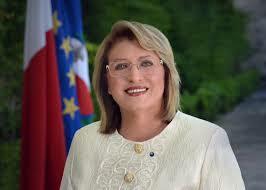 Marie-Louise Coleiro Preca was elected President of the Republic of Malta on the 4th April 2014. A Parliamentary resolution on 1st April 2014 approved her nomination as the ninth President of Malta. At the age of 55, Coleiro Preca is the youngest serving President of Malta and only the second woman to hold the post of Head of State. Coleiro Preca was born in Qormi on 7th December 1958. She was educated at St. George’s Primary School in Qormi, Maria Re?ina Girls’ Grammar School at Blata l-Bajda and at the Polytechnic, Imsida. Later she graduated with a BA in Legal and Humanistic Studies (International Studies) and obtained a Diploma Notary Public from the University of Malta. Coleiro Preca has also been a member of the National Bureau of Socialist Youths, President of the Women Section of the Party, founder member of the ?u?e Ellul Mercer Foundation and publisher of the Party’s weekly newspaper, Il-?elsien.